What is a Mini Meet Up? All of our Mini Meet Up Announcements will be found right here so be sure to check back often and we will see YOU at the next exciting and interactive event!! presented by acclaimed Author Marcy Carriker Smothers, which took place on ​Saturday February 23, 2019.
presented by acclaimed AuthorDonald Ballard to take place on ​Saturday September 22, 2018.
presented by Award Winning Author and Historian Mindy Johnson​ back on ​Saturday January 27, 2018. ​”Ludwig Von Drake meets the NBC Peacock: Walt Disney and the Color TV Revolution” presented by Disney Historian & Author Jim Fanning! ​to take place Saturday December 3rd in Issaquah Washington! ​We will celebrate the holidays, Walt Disney, Disneyland, great food, lots of laughs and fantastic Disney Friends! 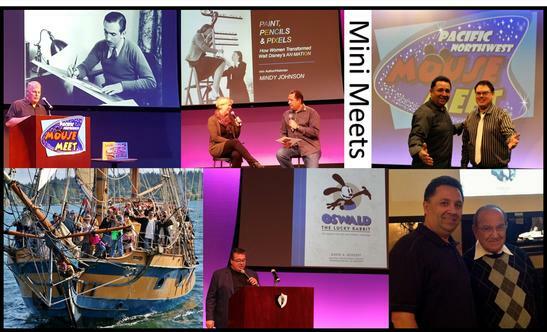 ​Authors Dave Bossert and Mindy Johnson will talk about thier books, the people and characters behind them including photos, stories, video clips and very rare footage of the Walt Disney Studios, Oswald The Lucky Rabbit and much more.